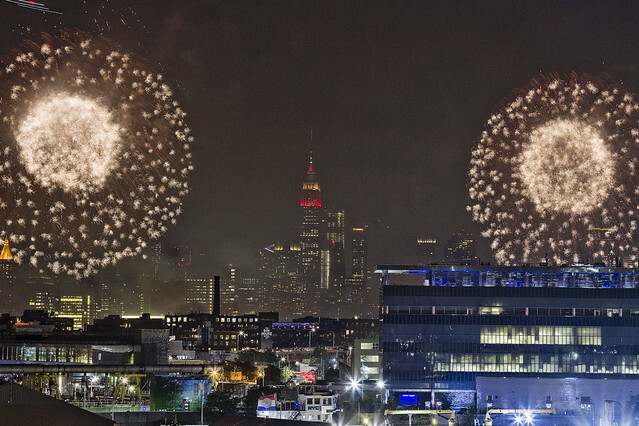 4th of July fireworks from the Kingsland Wildflower Green Roof in Greenpoint. A humble narrator was lucky enough to have gotten himself invited up onto the green roof at 520 Kingsland Avenue on the 4th of July, and accordingly I showed up with my holsters loaded up. I brought two distinct camera rigs, spent a bit of setup time encoding my “fireworks recipe” into them, and got busy. 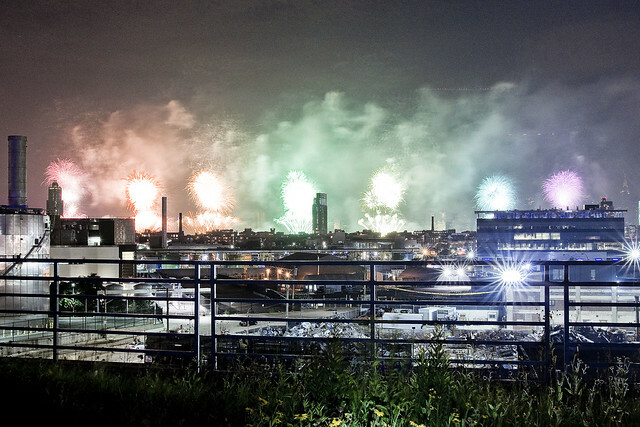 The fireworks recipe is anywhere from f.8-11, ISO 200, and 3-5 seconds exposure. You’ll want to preset focus and set your lens to manual focus (remember to turn any lens stabilization off), use a tripod and a cable shutter release, and ensure that the white balance is set to something consistent (I used “daylight” for these during capture, and adjusted the temperature a bit in camera raw during developing). 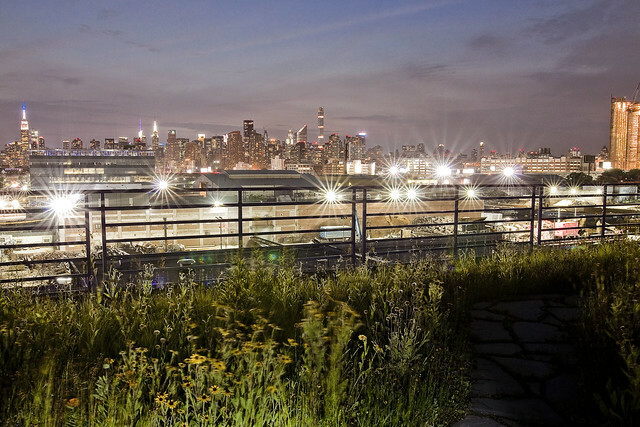 The Kingsland Wildfower green roof is a co production of Newtown Creek Alliance, Alive Structures, the Audubon Society, and the Broadway Stages company which owns the structure. 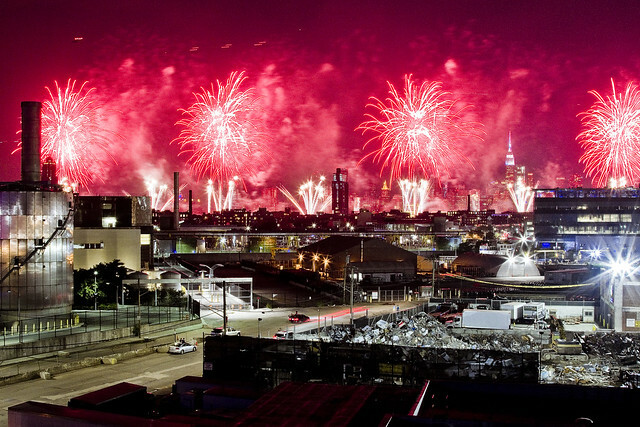 The green roof is 22,000 square feet, found at 520 Kingsland Avenue in Greenpoint alongside the Greenpoint Avenue Bridge, and is roughly 1.3 miles from the East River where – of course – the annual 4th of July fireworks display plays out. 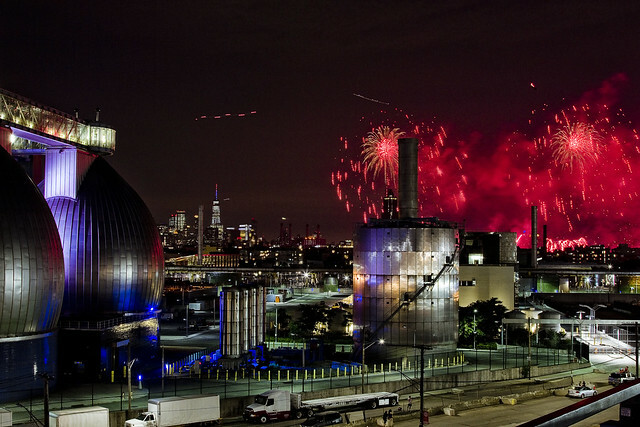 A few of the government facilities, like the Newtown Creek Wastewater Treatment Plant, decided to get in on the whole Fourth of July thing. They normally light the digester eggs up with a purplish blue light, this time around it was sequencing through red, white, and blue. I used my iPhone to gather video of it, if you’re interested in checking that out – click here. My main camera, the trusty Canon 7D, was loaded with a lens I refer to as “old reliable.” This is the one I left on autofocus, as I was constantly moving the point of view around and zooming in and out. Normally, the fireworks recipe involves locking in an infinity focus manually achieved, but “old reliable” is a trooper. The lesser secondary camera I brought is a consumer level Canon Rebel. It’s nowhere near as “smart” as the 7d, but it was set up with my second best lens – a Sigma 18-35 wide angle which was prefocused and set to manual so that it didn’t go hunting for focus in between shots. The camera was set up, and the cable release lock button engaged. It sat on top of its tripod and just clicked away. 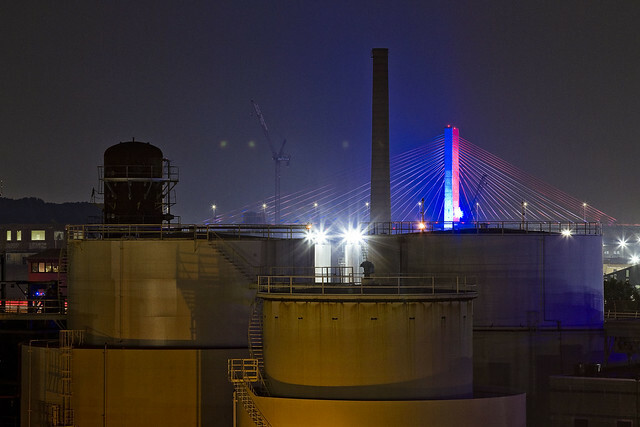 To the east, roughly 3/4 of a mile distant from 520 Kingsland and 2.1 miles from the East River, the new Kosciuszcko Bridge also got in on the light show act. Lit up all red, white, and blue. Saturday, July 14th – Exploring Long Island City – with NY Adventure Club. Long Island City is a tale of two cities; one filled with glittering water-front skyscrapers and manicured parks, and the other, a highly active ground transportation & distribution zone vital to the New York economy — which will prevail? Tickets and more details here. Sunday, July 15th – Penny2Plank – with Newtown Creek Alliance. There are eleven bridges crossing the modern day Newtown Creek and its tributaries, nine of which are moveable bridges of one kind or another. Other bridges, forgotten and demolished, used to cross the Creek. The approaches to these bridges are still present on the street grids of Brooklyn and Queens as “street ends.” Newtown Creek Alliance and a small army of volunteers have been working to transform these “street ends” from weed choked dumping grounds into inviting public spaces. This walk with NCA historian Mitch Waxman will take you there and back again, discussing the history and current status of these street ends and the territory in between. The tour will start in Brooklyn’s Greenpoint, and end in Queens’ Maspeth nearby the Grand Street Bridge.